Built in 1773, the porcelain screen, 3.5 metres high and 29.4 metres wide,stands in the big courtyard outside the Gate of Imeprial Supremacy (Huangji men). 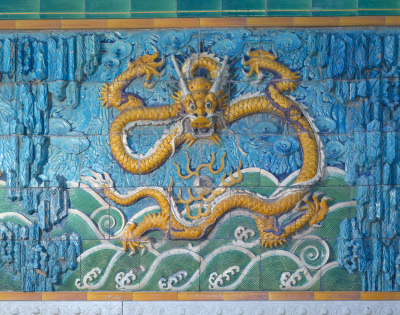 It is decorated with nine coiling dragons in various positions playing pearl among waves and clouds. On the Top of it is a hipped roof with one horizontal and four sloping ridges of glazed tiles,and at the lower part is a marble sumeru dais.